Gelsenkirchen is a strange place. A German city slowly moving on after an industrial past. Reminders are pretty much everywhere, of old factories illuminating happier days. There are nicer places to visit than Gelsenkirchen, but no better football team than Germany. Well that was the feeling as Martin O'Neill's side parked the 7-0 win over a pathetic Gibraltar team on Saturday, and started to prepare for Loew & Co.
Poland didn't quite agree. On Saturday night Irish celebrations were soured once word filtered through that Group D rivals Poland achieved their first ever win over Germany - three very important points for the Poles, who it seems will battle it out with Scotland and Ireland for second spot. Maybe Germany are suffering a post World Cup hangover. But their 29 shots on goal compared to Poland's five suggests otherwise. Germany are without Ozil, Reus, Kramer and the man with the best name in sport, Bastian Schweinsteiger. Remember Philipp Lahm and Miroslav Klose retired after the World Cup. In fact Joachim Loew has only one recognised striker in his squad, Max Kruse. That aside, If Martin O'Neill's team leave Germany with another three points it will be their greatest European qualifying win...ever! "The atmosphere within the team is good, not bad," said Loew. "The players have been self-critical, we talked about our missed chances against Poland. Everyone knows if we lead at half-time against Ireland we can take the three points." Safe to assume then, German confidence is typically very confident. As for the Republic. Played two, won two and an impressive goals tally (although everyone will hammer Gibraltar). All the talk of 'the book', in the words of Roy Keane, is "ancient history" and he refused to answer any more questions about it. Although when you release a controversial autobiography two days before an international match, and less than a week before Germany, it's hardly ancient history, is it? You can't help but wonder what Roy Keane the player would have made of it if Mick McCarthy, Steve Staunton or Marco Tardelli did the same. Since arriving in Germany on Monday morning, the focus has been on football. Martin O'Neill decided not to train at the Schalke Stadium on Monday night as planned, but in his pre-match press conference he agreed Tuesday's game resembles some of his Champions League encounters with Celtic. "It's like a big Champions League game. We have to go and perform. Really focused, really strong. We're going to try, try our upmost to get something from the game," said the Republic boss. "Celtic beat Juventus - I had some great moments at Celtic. This isn't Celtic - this is us and when you strip everything back and everything is said and done, this is where players what to be. "If we deliberately sit in, Germany will pick us off because that's what they do. Remember we like to attack as well." 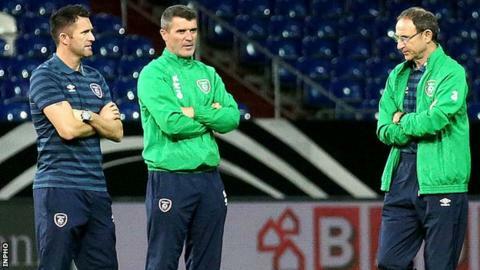 O'Neill wouldn't confirm if Robbie Keane will start against Germany despite scoring a hat-trick on Saturday. Keane has missed the previous two games against Germany, where the Irish conceded nine goals. Robbie Keane celebrates scoring against Gibraltar but will he start in Gelsenkirchen? "It's a different team from a few years ago, players haven't mentioned past games and they shouldn't. We're on a good run and we've plenty of confidence," said Keane. Mario Goetze was asked by a TV reporter after the Poland game, "Are Germany in a crisis?" Goetze looked at the reporter with sheer disgust, a look on his face that suggested 'what a stupid question' and just walked off. Germany certainly don't see themselves in a crisis. When all is said and done Germany expect to win, and most Irish fans will agree. Anything other than three points for the world champions would be a surprise, but not impossible. Since Germany won the World Cup they've lost two of their last three games. They are struggling by German standards. Anything other than three points for the Germans and Irish fans here will be over the moon, and if being honest a little shocked too.